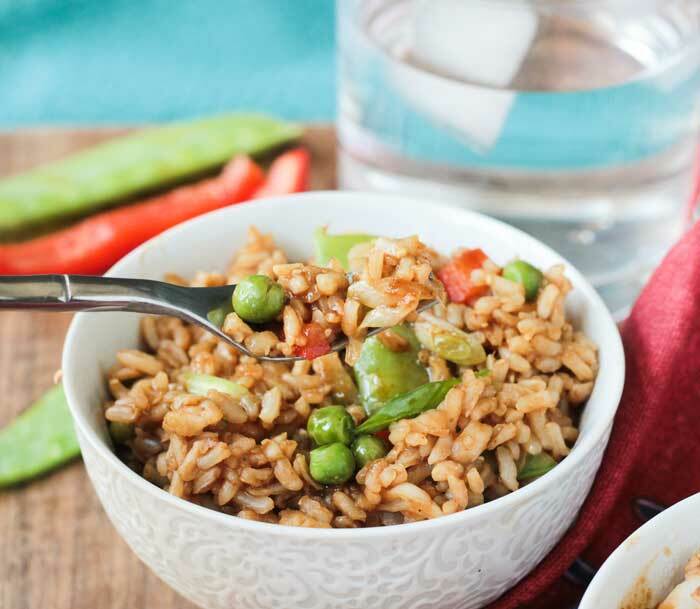 Easy Vegetable Fried Rice in less than 30 minutes! And it’s so good! Chinese take-out used to be one of our favorite treats when we decided to splurge and order food. The more and more I ate it and started to pay attention though, I realized it didn’t really taste all that great after all. Way too salty, too greasy and too slimy. Yuck! I wanted to create something to satisfy our cravings without ruining our healthy eating habits. This homemade fried rice was a big winner with the hubby and kids and we ended up eating it 3 times in one week when I first developed the recipe. 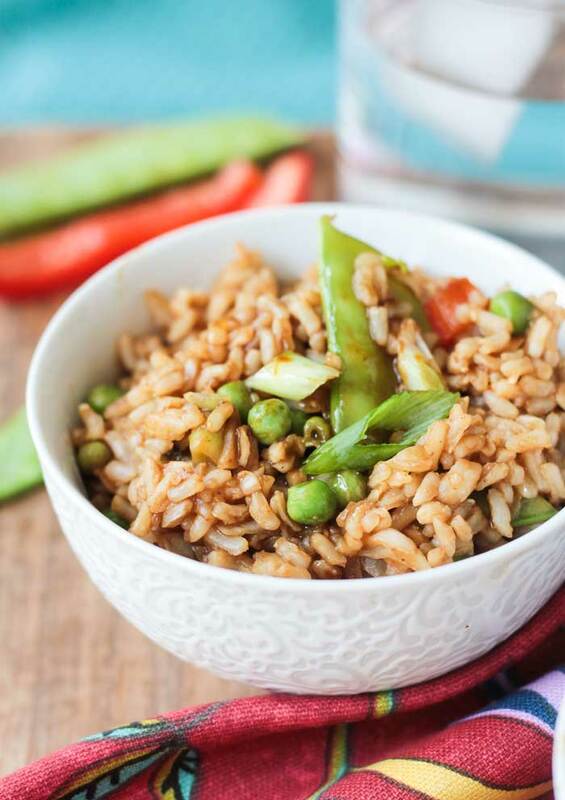 I hope you enjoy this Easy Vegetable Fried Rice recipe as much as we do! Leftover rice works best, so if you don’t have any leftover, make some quickly in the morning (I’ve used minute rice before and it works great!) and then it all comes together easily in one pan when you are ready for dinner! This recipe makes a a lot because we tend to eat it by itself…not on the side of something. It can easily be halved, if you wish. Oh man, I am totally craving this AGAIN as I type this up! Yum! 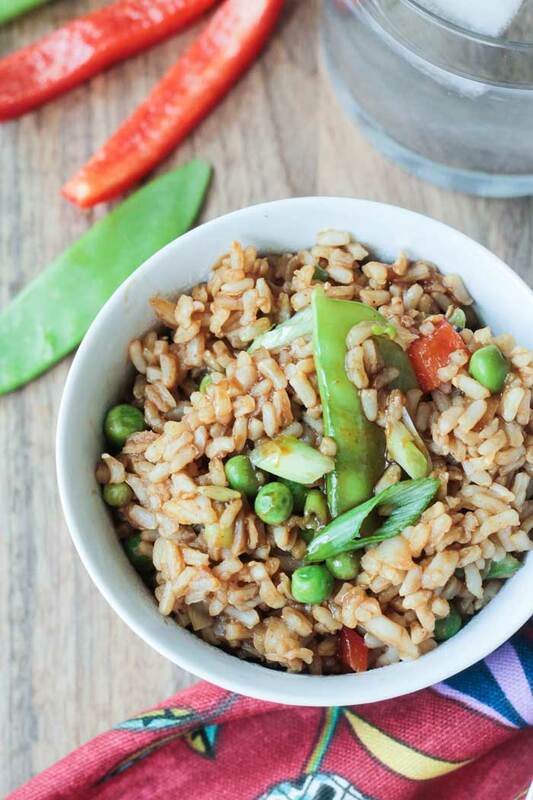 And you’ll be happy to know, this fried rice recipe is OIL-FREE!! 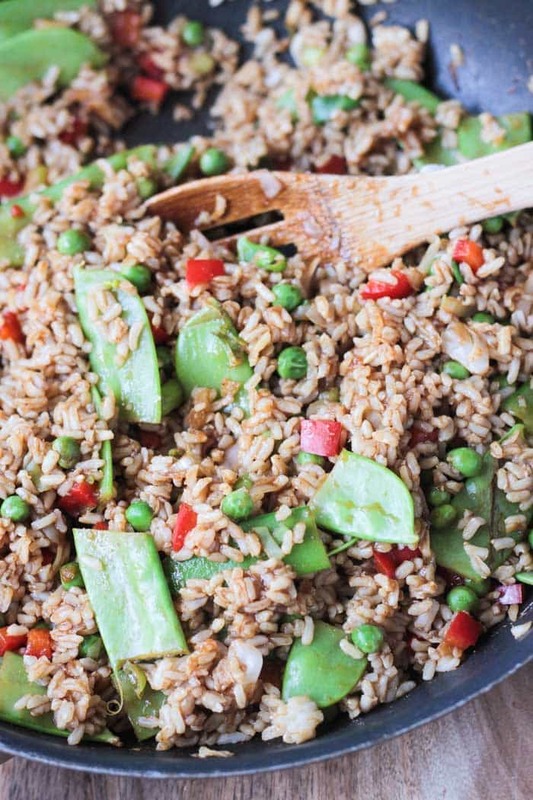 That’s right, FRIED RICE that’s oil-free…unheard of, right?! Well, technically, it’s not fried at all, so I guess that’s a bit misleading, but I promise you won’t need your Chinese take-out fix after trying this HOMEMADE version! Quick and easy homemade vegetable fried rice. 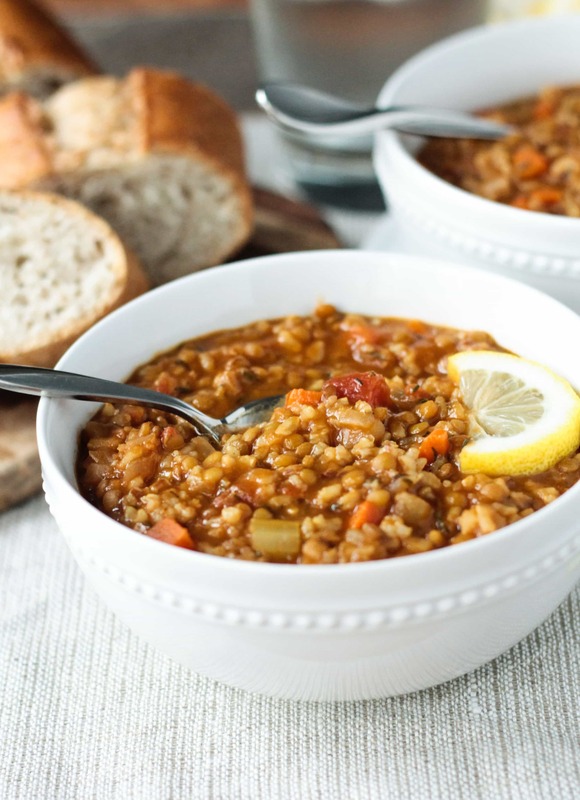 So flavorful and delicious, you can throw away your carry-out menu. It's oil-free and healthy too! Whisk together the tamari, hoisin, rice wine vinegar, garlic, ginger, and sriracha in a small bowl or measuring cup and set aside. In a hot skillet over medium-high heat, add 2 tbsp of water, cabbage, pepper and snow peas. Cook for 2-3 minutes, stirring frequently, just to start to soften. You want the veggies to retain their fresh flavor and still give a nice crunch, so don't overcook! Add the green onions and sweet peas and cook another minute while stirring. Add the sauce to the veggie and stir to coat. Add the rice and stir until evenly coated in the sauce. Continue cooking a few minutes to heat through. Take off heat and finish with a drizzle of sesame oil if desired. Serve with a few more dashes of sriracha if you like the heat! This looks so delicious! 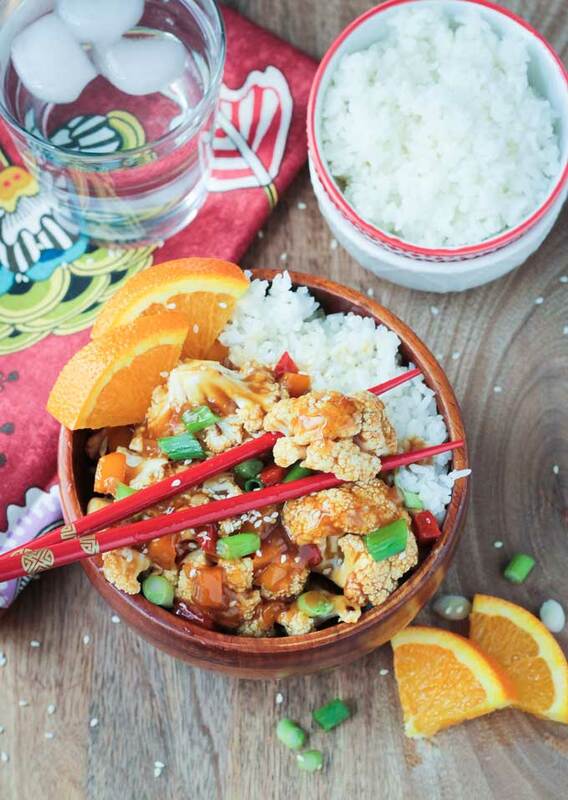 Love that we can enjoy a healthy version of a favorite Chinese food! Love how easy this is to make! Perfect for a busy weeknight meal. So much healthier than take-out too! Yup, perfect for a weeknight! And it’s great as a stand alone dish or as a side too. 🙂 Thanks, Lindsay! Homemade versions are always so much better! I love the restaurant stuff, but always feel like I have a slick of oil on my tongue and in my stomach afterwards. No good! 🙂 Thanks, Natalie! You had me at easy Jenn! I’ve been so in the mood for simple food lately, and adore all food Asian-style. The sriracha is a nice spicy touch, too. Right?! Easy is usually the name of the game around here. Especially with 3 kids! Thanks, Alisa! Made this last night for dinner. My picky kids ate it up! Thank you! Janet, that is so awesome to hear! My kids happily gobble it up too! Thank you! Looks delicious Jen! I love fried rice and anything healthy in that domain is good for me. Yum! Love the snap peas too! Ok, I did list snow peas. LOL! I need more coffee!!!! Oh no, it’s just me. I call all peas snap peas! LOL! This sounds delicious Jenn and like our kind of meal! I always HATE how I feel after eating greasy Chinese take out – blech!!! This sounds SO much lighter and satisfying! YUM! Thanks, Ceara! I hate feeling like I just drank a glass of grease! I totally agree with you Jenn. Chinese take out is so greasy and heavy, I always end up with a stomach ache after I eat it. Your fried rice looks delicious, so much better than any I’ve seen in a restaurant. Thanks, Linda! It always gave me a stomachache too! Now, I have to work on reinventing and veganizing the crab rangoons….those were my weakness!